This image shows Eli dressed in his navy blue Union Army officer's uniform, with the insignia (referred to then as 'shoulder straps') of a 2nd Lieutenant on his coat. It is believed this image was taken between March 1863 and February 1864 during the American Civil War. An electronic copy of the original image, and written permission to post it on the 80th Indiana website, are courtesy of Eli's Great Grandson Beach Hall. Eli was a resident of Edwardsport in Knox County, Indiana when enlisted in what became Company C of the 80th Indiana. 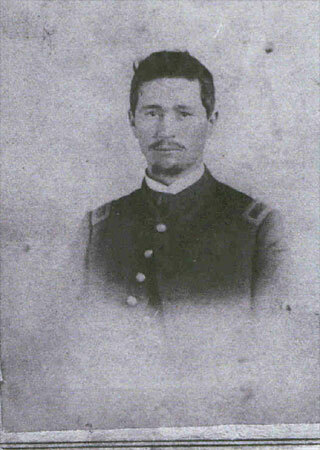 He was mustered into the Union Army at the rank of Corporal on September 3, 1862, at Camp Gibson, near Princeton in Gibson County, Indiana, when the unit was first formed. On March 19, 1863 Cpl. Bicknell was commissioned as the 2nd Lieutenant of Co. C by Indiana Governor Oliver P. Morton and was mustered in at that rank on May 1, 1863. On February 24, 1864 he was commissioned by the Governor as the 1st Lieutenant of Co. C and mustered in at that rank on July 1, 1864. 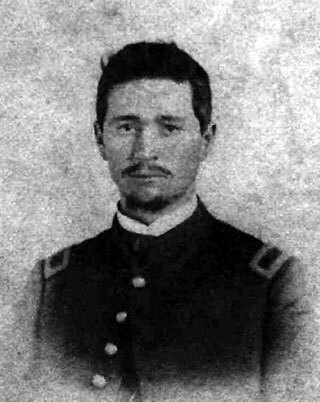 Lieutenant Bicknell was mustered out of the Army on June 22, 1865 at Salisbury, North Carolina, when the 80th was disbanded after the end of the war. With the information on this page it is possible to order a copy of this soldier's military service records, and his pension records if any exist, from the US National Archives and Records Administration. If you do, then please consider sending a copy of what you receive to the 80th's Webmaster so that more details about his service can be added to this site. All such contributions will be credited to the donor, by name, on the list of Modern 80th Indiana Volunteers. Thank you for your consideration. Source: Regimental Descriptive Rolls, 1861-1865, Volumes III, IV, and VIII, Report of the Adjutant General of the State of Indiana (Indianapolis, Indiana, 1866). All Rights Reserved. Created September 16, 2002. Last updated December 2, 2004.